Most, if not all, of the blog posts I’ve read about pavlovas begin by mentioning that the origin of the dessert is fiercely debated. Some argue that the pavlova is a purely Australian dessert, named after visiting Russian ballerina Anna Pavlova, while others argue it originated in New Zealand. I have found that the former is the generally agreed upon introduction to a post about pavlova. I hope it caught your attention like you never imagined a post about pavlova could. When I first read about the “issue” I found it pretty amusing. New Zealand and Australia both adamantly insist that the pavlova is their creation. Both governments have hired culinary anthropologists to confirm their claims about the origins of this dessert. Not surprisingly, the anthropologists were divided: Australian experts contended the pavlova was an Australian dessert, while New Zealand anthropologists had persuasive evidence against those claims. The New Zealand anthropologists also had those really neat kiwi birds with the long beaks to support their claims, in exchange for seeds and other food stuffs. Unfortunately for New Zealanders, who are often called “Kiwis”, some British scientists think that the kiwi bird is also originally from Australia. When another country claims that your national symbol is not really yours, culinary anthropologists are bound to step in. Doing so is in their fairly limited job description. If Americans started claiming that apple pie was not a Canadian dessert, I would be pretty upset to. Chef Sidney Crosby spent weeks perfecting the classic apple pie so that Canadians would have a perfect treat to snack on while watching competitive swimming, Canada’s national sport. Oh Chef Crosby, what delightful dessert will you come up with next? I sincerely hope it has maple syrup in it. The pavlova, regardless of its roots, is a delightful addition to any dinner table. Luckily, the pavlova is also an excellent addition to other types of tables. How could fresh fruit and whipped cream contained within a chewy meringue nest not be? For this rendition, I used strawberries, mangos, and passion fruit that I tossed in homemade honey-mint syrup before spooning over a freshly whipped cream-filled meringue. Despite their elegance, pavlovas are remarkably easy to assemble and require very little hands-on time. Most of the time, really, is spent watching your guests out of the corner of your eye for micro-expressions that confirm your pastry prowess. A chewy, yet slightly crispy, meringue nest filled with freshly whipped cream and mangoes, strawberries, and passion fruit tossed in a honey-mint syrup. Preheat the oven to 350°F. Whip the egg whites on medium speed until soft peaks form. 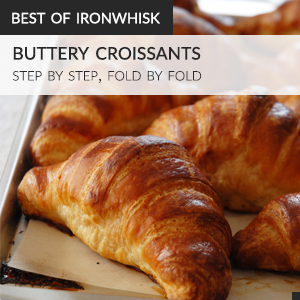 Add in the sugar one tablespoon at a time and continue beating until stiff, shiny peaks form. Whisk in the corn starch and vinegar. Grab a piece of parchment paper and using a glass and a pencil, outline twelve circles approximately 10cm/3.5 inches in diameter. Flip the paper over on a baking sheet and divide the meringue among the circles. Using a spoon, push the meringue to sides of the circle, making sure to leave the center lower than the edges in order for the shell to be able to hold the filling. Place in the oven and immediately reduce the temperature to 250°F. Bake for one hour and then turn off the oven. Leave the oven door slightly ajar, holding it open with a spoon perhaps, until the pavlovas are completely cool (approximately two hours). Whisk together the honey, lemon juice, and mint leaves. Toss together with the strawberries and mangoes. Place the meringue nest on a plate, fill with whipped cream, spoon fruit topping over, and pour some passion fruit pulp on top. Garnish, if desired, with mint or chocolate decorations. “Pasty prowess”..haha. You crack me up. This pavlova looks great and so colorful. Perfect for summer! 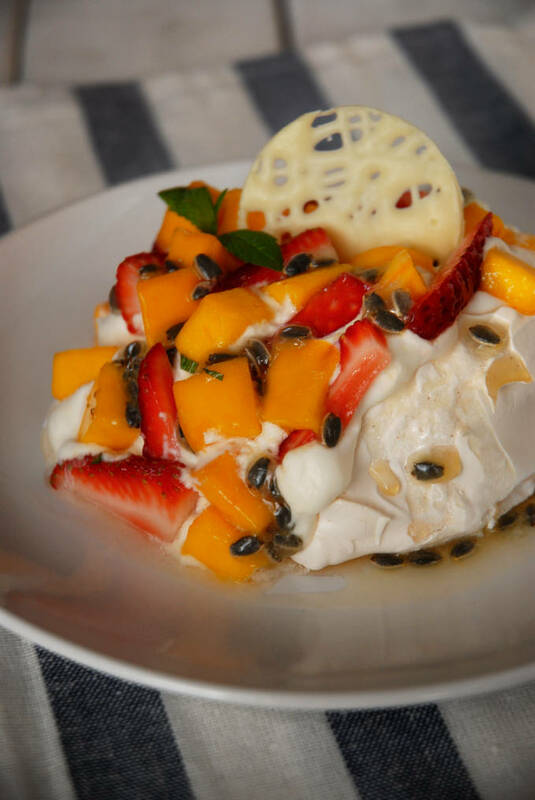 Pavlova is a perfect summer dessert. There is nothing like fresh fruit garnished with the sweetness of meringue and whipped cream. I wish I had the time to make one before dinner tonight! Thank you for sharing both the “debate” and the recipe. You always seem to read my mind when it comes to “what to make next”. Your pavlova is super elegant and lovely. Great work! I would love to try it…all the tropical fruit flavours…it must be amazing! I haven’t encountered a funny food blog before — I like it! This post made me laugh, and it’s the first one of yours I’ve read so far, so it bodes well. The pictures are wonderful too! Well of COURSE it was invented by the Kiwis… pulease! Great post – had a good laugh!